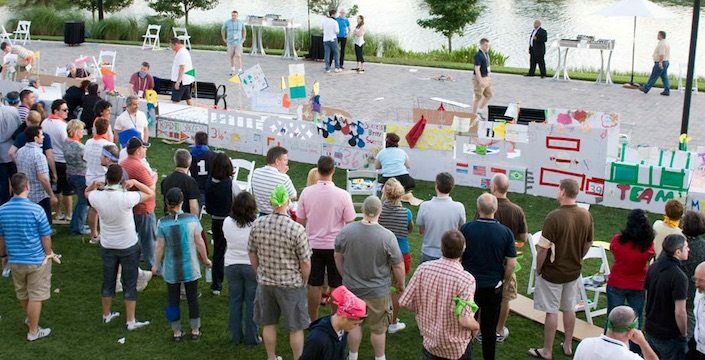 In a recent Bridge to the Future™ program, when we opened by telling a packed conference room of 500 people that they would be building a 215-foot bridge using only cardboard and duct tape, they laughed. When we told them we were going to drive over their completed bridge in a full-size golf cart with their CEO sitting shotgun, they gasped. When we told them our Bridge to the Future program would end with all 500 of them standing on the bridge at the same time, they finally realized we weren’t kidding. You have to check out this video! Bridge to the Future is another trademarked program of Best Corporate Events – the leader in innovative corporate events.